Calit2 : Ebb and Flow of the Diurnal Cycle: What's Its Relationship to Hydrology? Ebb and Flow of the Diurnal Cycle: What's Its Relationship to Hydrology? Jessica Lundquist backpacking along the Lyell fork of the Tuolumne. 11.21.02 -- "Mountain explorers and hydrologists both know about diurnal cycles in snow-fed streams," says Jessica Lundquist, Calit² graduate fellow at the UCSD Scripps Institution of Oceanography (SIO). Lundquist describes herself as a "high-altitude oceanographer" because most of the water involved in the snow-fed watersheds in the western U.S. ultimately derives from Pacific Ocean sources. Lundquist and the hydroclimate research team with whom she works have adopted an unusual field laboratory consisting of two mountain streams that drain the rugged terrain of Yosemite National Park in the southern Sierra Nevada. Besides Calit², this project is a component of NSF-sponsored ROADNet effort to develop real-time environmental monitoring through wireless communications and an integrated information management system. Additional funding is being provided by NOAA and the California Energy Commission. Lundquist points to the famous naturalist, John Muir, who, as early as 1912, described the diurnal phenomenon in The Yosemite . It's the gradual increase in the volume of river water as snow melts throughout the warmer hours of the day, peaking in the late evening when temperatures have fallen and melted snow has had time to run off into the stream basin. Then it's followed by a decline in water volume, and the cycle repeats itself the next day. "Anyone who's ever gone backpacking and camped too close to the river or, heaven forbid, on a relatively flat island in the river, figures this out before the night is over," Lundquist says with a laugh. "The snowpack provides a natural reservoir, which melts into runoff water in the spring and summer," says Lundquist. "In fact, more than half of our water supply comes from mountain snowmelt." Given the importance of snowmelt, scientists, over the last few decades, have observed an alarming trend: snow melting earlier in the season, which causes the dual problems of unexpected winter flooding and declining runoff later in the summer when we need it the most. National parks, because they are protected, provide a perfect environment, pun intended, to study how natural systems such as rivers respond to a changing climate. Even so, snowmelt processes are notoriously complex and, as a result, difficult to incorporate into larger-scale studies of hydrologic processes. 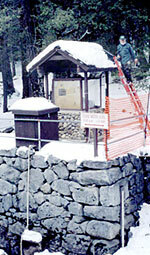 The historic gauge at Happy Isles that has a long record of streamflow. Snow piles up nonuniformly in both depth and density, especially in mountainous regions. Experimental "snow coring" is problematic to do, and the data may not represent the larger picture. Some support has been offered to scientific researchers in recent years in the form of satellite imaging and GIS, but it's still difficult to correlate that data with the runoff that occurs. Working under the direction of researcher Dan Cayan, director of the SIO Climate Research Division, Lundquist is studying the "shape and timing" of daily fluctuations in streamflow as related to location and rate of snowmelt. Her goal is to determine whether the cycle can help describe snowmelt operating on larger spatial and longer temporal scales in western basins. She's also optimistic that this work will help to calibrate future runoff models. There tends to be about a 10% difference between the daily trough and peak of streamflow relative to the daily average flow, Lundquist says. What time those peaks and troughs arrive at a given point along the stream, of course, varies with the season, temperature, basin topography, vegetation cover, and snowpack characteristics (such as depth and location within a basin). While diurnal cycles in neighboring rivers tend to follow similar patterns, the phenomena varies across larger distances and appears to depend on whether the streamflow is dominated by snowpack or other characteristics of the environment, such as evapotranspiration and infiltration into the streambed, which can have particular effect near or after the end of the melt season. An example of evapotransporation is plants drawing down the amount of water in a stream by absorbing it through their roots. Infiltration occurs when water seeps down into the soil lining the streambed. The viscosity, or resistance to flow, of water is lower at higher temperatures, so the greatest amount of water seeps into the streambed during the hottest part of the day. This phenomenon is partly responsible for many desert rivers drying out long before the water reaches the sea; evapotranspiration does the rest. From comparisons of the cycles in a number of basins over a number of years, Lundquist has been able to distinguish which diurnal characteristics are due to the basins themselves (fixed cycle from year to year but varying between basins) and which are due to meteorological and snow conditions (varying more between years than between neighboring basins). And, in fact, basins can switch from being dominated by the snowpack in the spring to being dominated by evapotranspiration and infiltration in late summer. The need to evaluate whether the basin topography influences the diurnal cycle more than snow depth led Lundquist to study two particular basins, the Merced and Tuolumne rivers in Yosemite National Park. But there was a heart-felt reason as well. 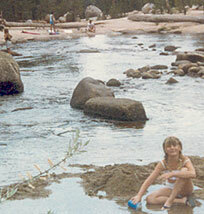 Jessica in the Tuolumne River at age 8. "When I was growing up, my family vacationed in Yosemite every summer," explains Lundquist. "I wanted to become a park ranger. I read every book on Yosemite and memorized every map. 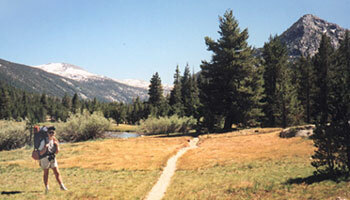 I virtually lived in the Tuolumne River. So I feel personal responsibility in some sense to take care of these resources." 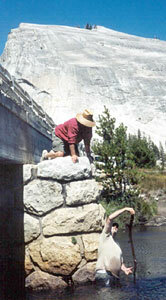 In the summer of 2001, Lundquist along with team members from SIO, the U.S. Geological Survey, and the California Department of Water Resources installed a research-monitoring network of 20 gauges that collects data every hour on how and when different subbasins contribute to overall river flows and diurnal cycles. The measurements obtained will be combined with remotely sensed data and modeling to try to determine where and when snowmelt occurs and how the resulting runoff courses through the system in relation to the diurnal cycle. "To measure the streamflow in a river," says Lundquist, "we use something called a Solinst levelogger, about the size of your palm. We place them on the bottoms of rivers, typically underneath bridges. The sensors, sensitive to pressure, measure the weight of water above, which can be correlated to height and, hence, volume of streamflow. Bridges constrain the flow and create a good cross-section so that the water depth can be related to the flow rates." Research monitoring snowpack has typically used "snow pillows" to measure the amount of snow at given points. "But, since snow tends to be a very heterogeneous medium," says Lundquist, "a measurement taken at one point may not be representative of a point just 20 feet away, especially in mountainous regions where the topography changes dramatically over short areas. Snow pillows are also bulky, difficult to install, and subject to the abuses of bears known to dig them up and destroy them." Lundquist drilling holes in "cake-pan-shaped" concrete weight so that the levelogger can feel the weight of the water above it. Currently, the leveloggers record data but cannot communicate with each other, and the data needs to be downloaded manually to a laptop. Emphasis on manually: This research is not for the timid or out-of-shape. The shortest way into one location, for example, is a 13.5-mile "hike" from the valley floor at 4,000-foot elevation to the upper reaches of the Merced River at 8,000 feet. "That's a 4,000-foot elevation gain!" says Lundquist with a grimace. "Hiking out of there was the only time in my life when I was genuinely unhappy to know that there were two waterfalls coming up on the trail before me." The steep terrain and treacherous snow conditions literally preclude accessing the equipment altogether during the winter months. "The reality is that we are only able to download the data once per year," says Lundquist. "So we're keeping a close eye on the wireless implementation at the Santa Margarita Ecological Reserve that Calit² is involved in. We would love to extend those capabilities to Yosemite, but there we're constrained by narrow canyons, dense forests, granite domes, and so forth that in many locations preclude direct line of sight and require more creative solutions." Not daunted by such constraints, the group "uses whatever works in any given spot." They are developing hybrid systems and leveraging available cell infrastructure such as along Highway 120 where certain meadows are open enough to enable a cell phone connection. The group is investigating wireless connections that don't require line-of-site and working on wireless connections between instruments that will connect to a hub that can relay information to the outside world. 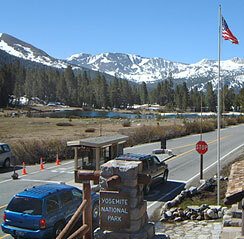 Picture of Tioga Pass entrance station (with view of mountains behind) where the research group plans to install a WebCam. They're also experimenting with video technology to complement the data sampling underway. "Tioga Pass at the entrance to Yosemite Park is closed in with snow in the winter," says Lundquist, "but it has a great view of the mountains. So we're putting up a WebCam to monitor conditions, sampling once per day and accessing the data via land-line phone to the Internet." And how do the park rangers, not to mention the environmentalists, feel about their instrumenting the great outdoors? "They are totally on board with what we want to do," says Lundquist. "The park rangers are very enthusiastic because they want to understand the streams better. And the winter park rangers at Tuolumne Meadows have volunteered to routinely collect observations during their ski and hiking patrols. Kelly Redmond, Jessica Lundquist, Dan Cayan, and Mike Dettinger at a meeting with park service officials in October 2002. Particularly key is that we've had discussions with park management to train the ranger staff as stream gaugers, which will provide us with crucial measurements necessary to convert our pressure measurements into streamflow."